The Junkanoo carnival procession in celebration of the New Year may be well and truly over, but that doesn't stop the Bahamas from being the perfect spot for a January getaway. Discover endless entertainment at Atlantis LIVE, which has featured a multitude of performers from Jimmy Kimmel to Lady Gaga, or grab a cocktail in one of the many bars and lounges before dancing the night away at the Aura nightclub. To recover, guests can tender to pretty Rose Island, or unwind at the beachside Sivanda Ashram Yoga Retreat on Paradise Island. Otherwise, indulge in a treatment at the Mandara Spa for ultimate relaxation. Charter superyachts can berth at the Atlantis Marina on Paradise Island and zip to the Atlantis casino for a lavish dinner. Must-know: The New Year’s Day Sailing Regatta on 1 January sees traditional Bahamian sloops racing in Montagu Bay between Nassau and Paradise Island. The Junkanoo carnival procession in celebration of the New Year may be well and truly over, but that doesn't stop the Bahamas from being the perfect spot for a January getaway. Discover endless entertainment at Atlantis LIVE, which has featured a multitude of performers from Jimmy Kimmel to Lady Gaga, or grab a cocktail in one of the many bars and lounges before dancing the night away at the Aura nightclub. To recover, guests can tender to pretty Rose Island, or unwind at the beachside Sivanda Ashram Yoga Retreat on Paradise Island. Otherwise, indulge in a treatment at the Mandara Spa for ultimate relaxation. Charter superyachts can berth at the Atlantis Marina on Paradise Island and zip to the Atlantis casino for a lavish dinner. Must-know: The New Year’s Day Sailing Regatta on 1 January sees traditional Bahamian sloops racing in Montagu Bay between Nassau and Paradise Island. Dominican Republic’s sleepy Samaná Peninsula is one of the best whale-watching destinations in the world. Each year, thousands of humpbacks travel to Samaná Bay, their breeding ground. Human voyeurs are nearly guaranteed a sight of the magnificent creatures from mid-January to late March, making Samaná Peninsula the perfect island to visit on a superyacht charter in February. You can also cruise to Los Haitises National Park, with its otherworldly rock formations. Must-know: The luxe La Marina Casa de Campo on the Dominican Republic south coast offers superyacht dockage, fuelling, a chandlery and a shipyard with a 120-tonne lift. Dominican Republic’s sleepy Samaná Peninsula is one of the best whale-watching destinations in the world. Each year, thousands of humpbacks travel to Samaná Bay, their breeding ground. Human voyeurs are nearly guaranteed a sight of the magnificent creatures from mid-January to late March, making Samaná Peninsula the perfect island to visit on a superyacht charter in February. You can also cruise to Los Haitises National Park, with its otherworldly rock formations. Must-know: The luxe La Marina Casa de Campo on the Dominican Republic south coast offers superyacht dockage, fuelling, a chandlery and a shipyard with a 120-tonne lift. From March 10-13 this year, big and beautiful sail and motor yachts from around the world gather for racing and glitzy parties on the haven of Virgin Gorda in the British Virgin Islands. Boat International Media organises the event – the Loro Piana Caribbean Superyacht Regatta & Rendezvous — with superyacht hangout Yacht Club Costa Smeralda. 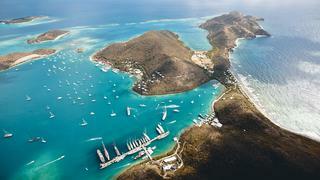 Must-know: YCCS Virgin Gorda can accommodate charter superyachts of up to 88 metres, with a draught of up to nine metres. And Oil Nut Bay, next door, offers a fantastic yoga programme. From March 10-13 this year, big and beautiful sail and motor yachts from around the world gather for racing and glitzy parties on the haven of Virgin Gorda in the British Virgin Islands. Boat International Media organises the event – the Loro Piana Caribbean Superyacht Regatta & Rendezvous — with superyacht hangout Yacht Club Costa Smeralda. Must-know: YCCS Virgin Gorda can accommodate charter superyachts of up to 88 metres, with a draught of up to nine metres. And Oil Nut Bay, next door, offers a fantastic yoga programme. The white and gold splendour of the Greek Orthodox Church and heavenly natural beauty makes Easter in the island of Cyclades a gorgeous spectacle for a superyacht charter. Try the Good Friday procession in Pyrgos on Santorini, or the series of Byzantine tableaux vivants on Paros. And, of course, there are vast beaches to enjoy in Greece during the spring sunshine. 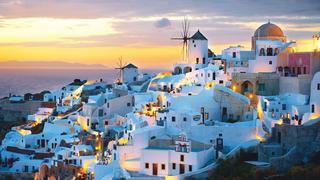 Must-know: Dine finely at Selene in Pyrgos on Santorini, or the Red Bicycle in Oía. Be sure to check whether these spots will be open for the Greek Orthodox Easter on 16 April. The white and gold splendour of the Greek Orthodox Church and heavenly natural beauty makes Easter in the island of Cyclades a gorgeous spectacle for a superyacht charter. Try the Good Friday procession in Pyrgos on Santorini, or the series of Byzantine tableaux vivants on Paros. And, of course, there are vast beaches to enjoy in Greece during the spring sunshine. Must-know: Dine finely at Selene in Pyrgos on Santorini, or the Red Bicycle in Oía. Be sure to check whether these spots will be open for the Greek Orthodox Easter on 16 April. 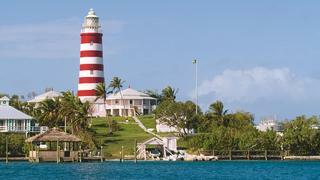 Keen anglers will find the Abaco Islands the perfect islands to visit on a superyacht charter in May. Invitation-only, the Bahamas’ Custom Shoot-Out is the fishing tournament for elite anglers. After lines-in each day, diversions include silent auctions and a fastest boat competition. This year’s dates – May 17-20 in The Abaco Beach Resort & Boat Harbour Marina – are also the perfect time to visit Hope Town’s idyllic harbour and watch traditional wooden boatbuilding on Man-O-War Cay. Must-know: Baker’s Bay Golf & Ocean Club, on Great Guana Cay, has one of the best-protected marinas in The Bahamas and accommodates yachts up to 76 metres. 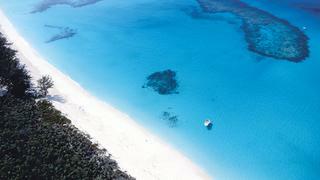 Keen anglers will find the Abaco Islands the perfect islands to visit on a superyacht charter in May. Invitation-only, the Bahamas’ Custom Shoot-Out is the fishing tournament for elite anglers. After lines-in each day, diversions include silent auctions and a fastest boat competition. This year’s dates – May 17-20 in The Abaco Beach Resort & Boat Harbour Marina – are also the perfect time to visit Hope Town’s idyllic harbour and watch traditional wooden boatbuilding on Man-O-War Cay. Must-know: Baker’s Bay Golf & Ocean Club, on Great Guana Cay, has one of the best-protected marinas in The Bahamas and accommodates yachts up to 76 metres. 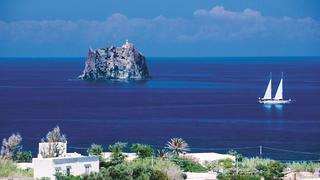 For those who don’t want to get away from it all, a superyacht charter in June to the Aeolian Islands is perfect. If you want a taste of Med season glamour but Monaco and Saint-Tropez have lost their shine, head to the Aeolian Islands north of Sicily. June is pleasantly buzzing with glitterati and Panarea is where to mingle – principally at the Hotel Raya or the Bridge sushi bar. 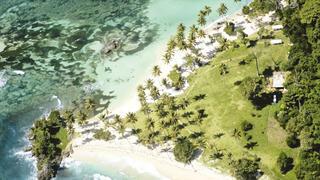 The location is gorgeous, with rugged walks and islets perfect for exploration by luxury yacht. Further on, Lipari has a wild and wonderful coastline, Salina, boutiques and vineyards and, on Stromboli, an active volcano. Must-know: Zimmari is a good secure anchorage in Panarea, with clear water and great diving over volcanic rock formations and wrecks. For those who don’t want to get away from it all, a superyacht charter in June to the Aeolian Islands is perfect. If you want a taste of Med season glamour but Monaco and Saint-Tropez have lost their shine, head to the Aeolian Islands north of Sicily. June is pleasantly buzzing with glitterati and Panarea is where to mingle – principally at the Hotel Raya or the Bridge sushi bar. 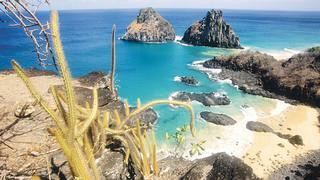 The location is gorgeous, with rugged walks and islets perfect for exploration by luxury yacht. Further on, Lipari has a wild and wonderful coastline, Salina, boutiques and vineyards and, on Stromboli, an active volcano. Must-know: Zimmari is a good secure anchorage in Panarea, with clear water and great diving over volcanic rock formations and wrecks. 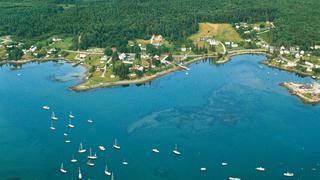 Maine, New England, is a great place to spend the Fourth of July on a superyacht charter. It is well-suited to sailors, with reliable winds and 4,613 idyllic islands to explore. On July 6 and 7, 2017, Penobscot Bay hosts the Great Schooner Race and on the day itself Bar Harbor, Mount Desert Island, holds a spectacular parade and fireworks. Must-know: From Rockport to Mount Desert Island, navigate carefully: depth can run from 91 metres to 5 centimetres in four boat lengths. 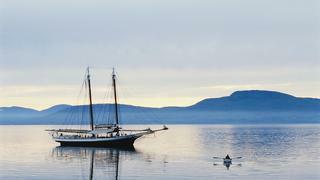 Maine, New England, is a great place to spend the Fourth of July on a superyacht charter. It is well-suited to sailors, with reliable winds and 4,613 idyllic islands to explore. On July 6 and 7, 2017, Penobscot Bay hosts the Great Schooner Race and on the day itself Bar Harbor, Mount Desert Island, holds a spectacular parade and fireworks. Must-know: From Rockport to Mount Desert Island, navigate carefully: depth can run from 91 metres to 5 centimetres in four boat lengths. The hauntingly beautiful landscape of fjords and forested islands of Desolation Sound on Canada’s west coast is one of the best spots in the world to see grizzlies – most visible in July, August and September. A bumper salmon run last year meant lots of cubs, so August 2017 is the best time to visit these islands on a superyacht charter. Must-know: Classic motor yacht Pacific Yellowfin, with her experienced crew, is one of the best charter yachts in the region and has a weekly rate starting from $79,000. The hauntingly beautiful landscape of fjords and forested islands of Desolation Sound on Canada’s west coast is one of the best spots in the world to see grizzlies – most visible in July, August and September. A bumper salmon run last year meant lots of cubs, so August 2017 is the best time to visit these islands on a superyacht charter. Must-know: Classic motor yacht Pacific Yellowfin, with her experienced crew, is one of the best charter yachts in the region and has a weekly rate starting from $79,000. The Korkyra Baroque Festival stands out among the riot of parties and concerts that keep the summer months sizzling among the Croatian islands. Held in September – exact dates for 2017 are yet to be confirmed – crowds have dissipated but the days are still sunny. 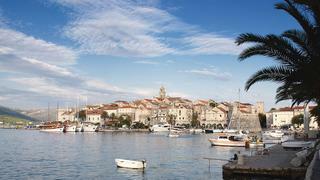 Visit the island of Korcula on a superyacht charter (think mini Dubrovnik) so you can enjoy Vivaldi and Monteverdi in medieval splendour. Must-know: The restaurant at luxury hotel Lesic Dimitri Palace has a terrace on the walls of the old town, with spectacular views of the Adriatic. An ACI Marina is less than five minutes from the old town and even the very largest yachts can anchor off the old town. The Korkyra Baroque Festival stands out among the riot of parties and concerts that keep the summer months sizzling among the Croatian islands. Held in September – exact dates for 2017 are yet to be confirmed – crowds have dissipated but the days are still sunny. Visit the island of Korcula on a superyacht charter (think mini Dubrovnik) so you can enjoy Vivaldi and Monteverdi in medieval splendour. Must-know: The restaurant at luxury hotel Lesic Dimitri Palace has a terrace on the walls of the old town, with spectacular views of the Adriatic. An ACI Marina is less than five minutes from the old town and even the very largest yachts can anchor off the old town. Not many superyachts visit this beautiful and largely undisturbed Atlantic island – some 200 miles off Brazil – but that’s the point. This is the perfect island to visit on a superyacht charter to be truly alone on a beach, to swim with spinner dolphins in Dolphin Bay and to plunge into more than 25 scuba sites that few have seen. October – the climax of “dry” (not high) season here – is the ideal time to visit. Must-know: Pousada Maravilha offers luxury bungalows, a spa and some heavenly creations by the chef. Not many superyachts visit this beautiful and largely undisturbed Atlantic island – some 200 miles off Brazil – but that’s the point. This is the perfect island to visit on a superyacht charter to be truly alone on a beach, to swim with spinner dolphins in Dolphin Bay and to plunge into more than 25 scuba sites that few have seen. October – the climax of “dry” (not high) season here – is the ideal time to visit. Must-know: Pousada Maravilha offers luxury bungalows, a spa and some heavenly creations by the chef. 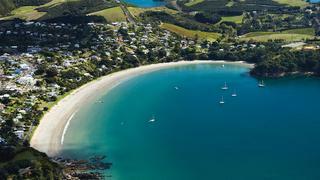 Just 17.7 kilometres from the marine facilities of Auckland, Waiheke’s vineyards, olive groves and white sandy beaches feels like a world of its own. This is the ideal island to visit on a superyacht charter in November because, being late in the New Zealand southern spring, it avoids the crowds of summer. The Matiatia Headland Walkway offers the best of many stunning walks, while you can tender up to Man O’ War Vineyard. Must-know: Waiheke is on the edge of some exciting island-cruising north west of Auckland where you can discover some wild treasures of New Zealand. Just 17.7 kilometres from the marine facilities of Auckland, Waiheke’s vineyards, olive groves and white sandy beaches feels like a world of its own. This is the ideal island to visit on a superyacht charter in November because, being late in the New Zealand southern spring, it avoids the crowds of summer. The Matiatia Headland Walkway offers the best of many stunning walks, while you can tender up to Man O’ War Vineyard. Must-know: Waiheke is on the edge of some exciting island-cruising north west of Auckland where you can discover some wild treasures of New Zealand. Ocean Reef Club’s Vintage Weekend gathers classic cars, yachts and planes in one paradisiacal location on the island of Key Largo. The first weekend in December is the only time the private club opens its doors to non-members; well worth a visit on a superyacht charter in December. Its superyacht marina and luxury onsite amenities (golf, beach club) are also a strong draw. Must-know: Head south and snag a slip at the romantic and private Little Palm Island to enjoy its tasting menu or a bespoke spa treatment. 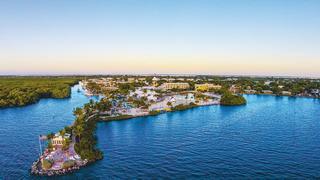 Ocean Reef Club’s Vintage Weekend gathers classic cars, yachts and planes in one paradisiacal location on the island of Key Largo. The first weekend in December is the only time the private club opens its doors to non-members; well worth a visit on a superyacht charter in December. Its superyacht marina and luxury onsite amenities (golf, beach club) are also a strong draw. Must-know: Head south and snag a slip at the romantic and private Little Palm Island to enjoy its tasting menu or a bespoke spa treatment.